Visit the oldest Euro-American settlement in Minnesota where four distinctive limestone buildings grace the Minnesota River bluff across from Historic Fort Snelling. These buildings mark the American Fur Company's control over the region's Dakota trade between 1825 and 1853, when Mendota was a major center of the region's fur trade. The Sibley Historic Site is on the southern bluff of the Minnesota River upstream from its confluence with the Mississippi. The site includes four of Minnesota's oldest buildings, including the home of Henry Hastings Sibley — fur trader, General, and controversial first Governor of Minnesota. 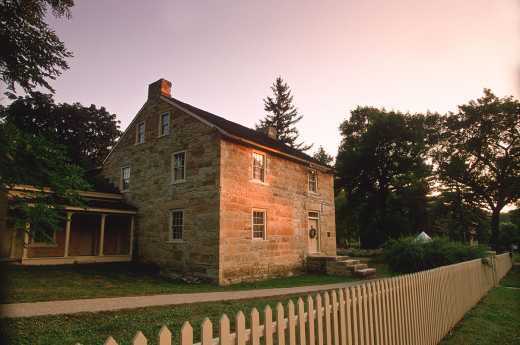 The Sibley Historic Site offers events, seasonal guided tours, and a museum shop. Born on Feb. 20, 1811, in Detroit, Henry Hastings Sibley came to the junction of the Mississippi and Minnesota Rivers in 1834 as the regional manager of the American Fur Company. Sibley went on to become one of the most influential figures in Minnesota history. His career included working as the region's most prominent fur trader; serving as a politician and territorial delegate to the U.S. Congress; election as the first governor of the state of Minnesota; and serving as a general during the U.S.-Dakota War of 1862. Admission for tours: DCHS members FREE! ; Adult $7; Senior(60+)/Veterans/College Students $6; Student (6-17) $5; children 5 and under free. The Site will be open from Memorial Day through Labor Day, Saturday and Sunday, 1:00 - 4:00 p.m. For special group tours, please call 651-452-1596.